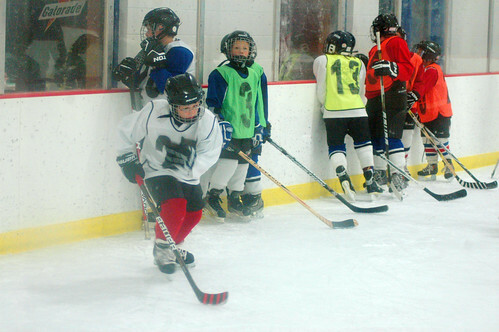 a year ago odin was an 8 year old trying out to play with 9 and 10 year old “squirts” and he made the squirt B team. 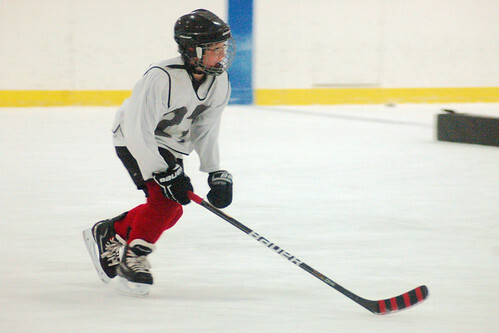 this year, now that he’s 9 and has a season of playing with the older squirts under his belt, the question is whether or not he has the skills to make the squirt A team. the day of tryouts has finally arrived! i think he definitely has the skills to make the A team, but there’s a big difference between 9 and 10 year old skating skills, so who knows. on the one hand i think he’d do well as one of the better B team players and would thrive as a leader on the ice. on the other hand, he pushes himself when he’s around better skaters and he could learn a lot by being on the A team ( he’s in the red socks ). he has a pretty good perspective on the whole thing and claims to be relatively unconcerned with which team he ends up on. it’s neat to watch him have the inherent motivation to just do his best and be happy with whatever happens. Previous Poston the effects of long commutesNext Postday 3413: odin’s on The A Team! Pingback: snowdeal.org - day 3413: odin’s on The A Team!